Israel In Prophecy » KeyIssues/LEGEND AND COMMENTS for ISRAEL'S HISTORY - why is it so unique?? LEGEND AND COMMENTS for ISRAEL'S HISTORY - why is it so unique? both are equivalent in God and Satan's eyes. Antisemitism from nations would be less and the world harvest greater if the church and Israel presented a united front and a united witness. AntiChristianity from the nations will increase if the church fails to reconcile with her Jewish roots and stand alongside Israel to help her fulfill her calling to the nations. The danger is sheer apostasy. The sword out of Yeshua's mouth is two-edged. One cannot take a partial truth and make it whole, rejecting the rest of the truth. It's the whole truth or none at all. Israel's regathering in the land and the revival among the Jewish remnant are signs for the church to rally behind her in prayer and supplication.
" Nations' point of view"
The fields of the harvest are white: there are many good people out there who have not heard the gospel or understood it because it was not presented as an unbiased and clear report of what is truly going on in the world. Yet their hearts will not countenance or side with the monstrous evil that is now rearing its head. The persecution will move many hearts to the Lord and His Messiah. 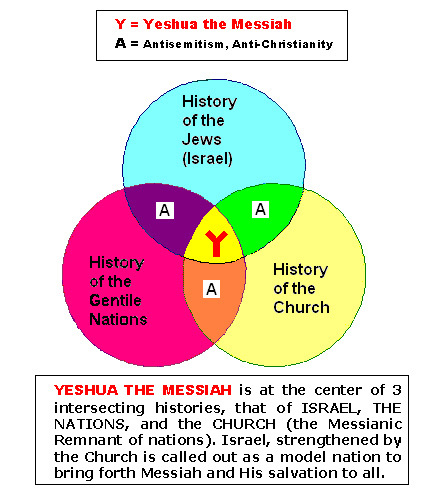 The lies of antisemitism and antichristianity going to bed together must be exposed!!! If God has a separate plan for the nation of Israel - apart from His church, does it not mean that Jews are saved in a different way than Christians are? See VIII.F.5.